Today I have some bargain ebay brushes that I'd like to share with you. I've had these for a while now so I'm not that late in jumping on the bandwagon! Firstly, let's talk about the 99p brushes. Yes, only 99p! I couldn't believe it either. The numbers sound a little reminiscent of the MAC brushes, which I can't compare them to as I don't own them (obvs they aren't going to be as good quality) although from seeing the infamous MAC 217 blending brush the shape looks pretty similar! These brushes are the main ones I use when doing my eye make up and I now own two of the 217 blending brush. They wash up quite nicely, although the hairs have splayed a little. I haven't experienced any shedding, apart from with the black one after washing it, but overall these brushes are such good quality for the price!! I can't praise them enough! And of course, I think I will invest in a MAC 217 one day, but these will do me fine for now! Next up is a synthetic brush set which I have seen floating around the blogging/vlogging community. I first saw Gabby from velvetgh0st use a similar face and eye brush set, which set me on the hunt to find a set with just the eye brushes in. These are perfect to use with cream eyeshadows and concealers, as they are small enough the get into all the nooks and crannies! They are also great for blending out any eyeshadow disasters (taking eyeshadow up too high/close to my brow is quite frequent!) as they are very dense. These brushes wash up really nicely and I haven't experienced any shedding! They are also so soft on the skin - just like the Real Technique brushes! 4 comments on " BARGAIN EBAY BRUSHES"
I actually ordered a 24 piece set that came today for £7.50.. They aren't in my hands just yet but I'm excited to try them!! 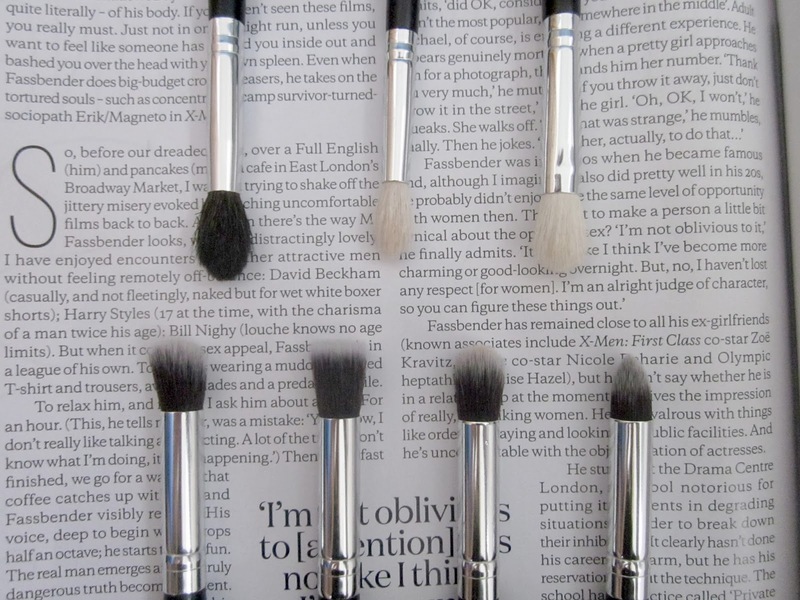 I really need to try some ebay bargain brushes! great post! !